Well regardless, I like the sunglasses because they look cool. The TR90 frame material is extremely strong, has memory, and is very lightweight. In addition, the glasses have full coverage so you don't lose your peripheral vision. This is important when you shank your ball straight sideways into the woods like I do. It's embarrassing enough to shank it sideways, but then having to ask somebody where your ball went -- that's tough. The lenses are next-generation Neox NX9 which gives you the most acute visibility with the best protection. The lenses allow only nine percent of light transmission. I recommend these to all golfers -- and all athletes for that matter. 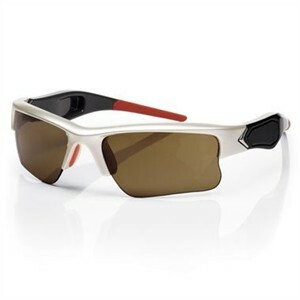 These Callaway Chev Xtreme glasses are very modern and will give you the highest-tech glasses to make you the coolest "Ergonominaut" on the golf course.